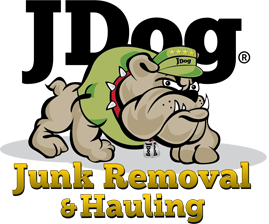 Thank you for considering an investment in a JDog Junk Removal franchise. Are you a veteran or veteran family member looking for an opportunity to build your own business? Are you looking for a proven system that gets you into business quickly, has low start-up costs, has high margins, is easy to operate, and has strong consumer demand? 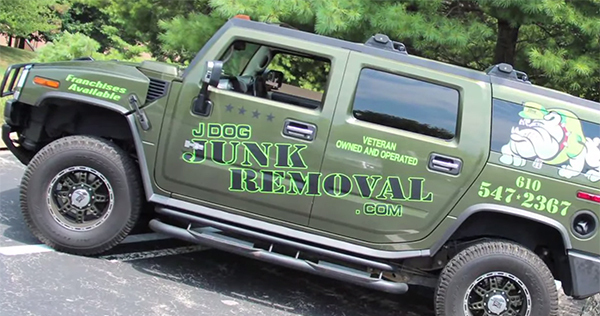 Then owning a JDog Junk Removal franchise may be for you. We encourage you to investigate this opportunity thoroughly – being part of the JDog military veteran family has tremendous advantages – and we are confident that you will find our business model compelling. The JDog brand is about feeling great! When people see your camo wrapped truck and trailer and see you and your team, they’ll honk their horns, wave, or flash their lights – you’ll be greeted warmly because your community loves supporting military veterans and military family members! When you enter your customers’ homes they will have the peace of mind of knowing that their home and belongings will be respected and they can trust that the price you quoted is the price they’ll pay. And when you leave their homes or business broom clean and free from old clutter, they’ll be amazed at their new space and new sense of freedom; but most of all, they’ll feel great that you supported a veteran! They will thank you for your service to you country and for providing such a wonderful service – it is very gratifying and fulfilling – that’s the JDog Brand! Our business model is based upon the premise that Americans will always support a veteran owned business when they have the opportunity! The junk removal business is very lucrative. But when you have a compelling, sustainable, competitive advantage – an all military veteran brand – the sky is the limit! And when you take into consideration what it costs to secure ownership and how much you can make, you’ll be challenged to find another business opportunity that offers you so much! And when you get together with the other franchise owners who understand the concept of service and sacrifice, you’ll know you are part of something very special – what we call the JDog Movement. To begin the franchise acquisition process, we encourage you to complete the Request Free Info form at right – we will then send you the JDog Business Overview, which will get the ball rolling! We will then get in touch for a Get Acquainted call where you will speak to a fellow veteran so you can get to know us and we can get to know you! In that call we’ll also describe next steps and help you to understand whether being part of our family is right for you!